Yummy and beautiful looking. 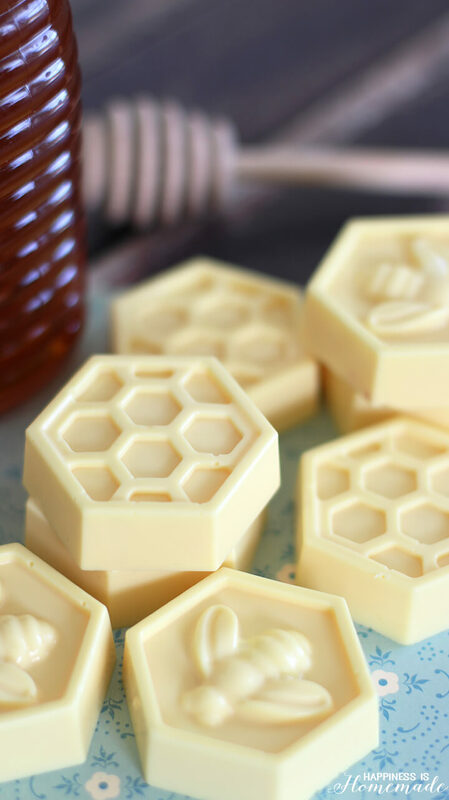 Cannot wait to try making these. I am hoping to make and give as gifts. Thank you so much for sharing. 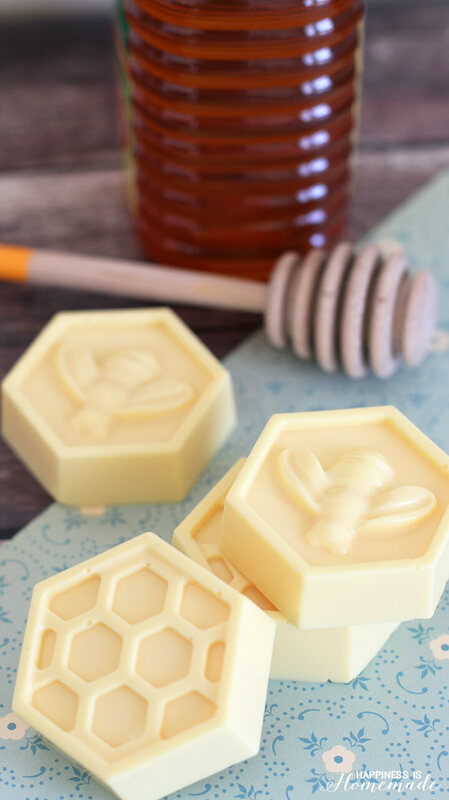 Thank you for sharing great soap recipes here. I am o happy to have found your blog. Can you please make recipe for lavender goat milk soap? Thank you in advance. 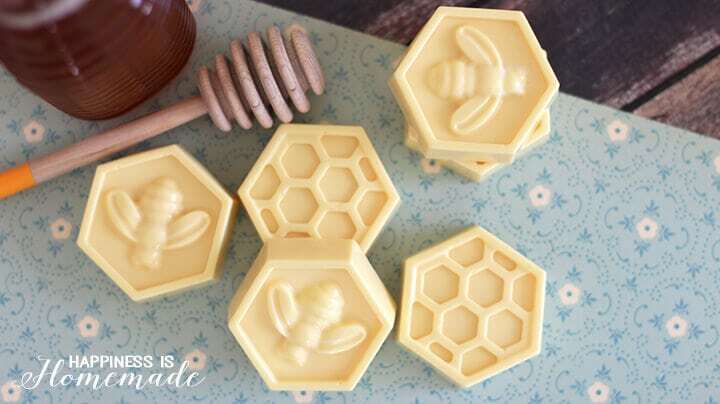 These soaps look so cute, I love the bee theme. 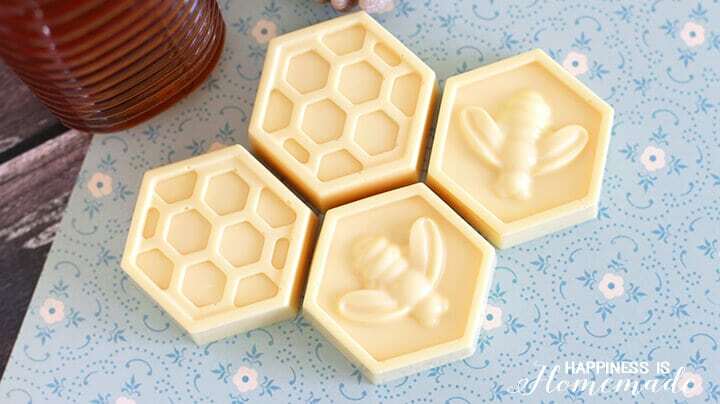 I agree that honey and milk is an excellent combination, especially in soap. I was worried that this would be hard to make, but I feel more confident that I can do this after I’ve read it. Thank you for this recipe! I made these with my Youth group at church. We made them as gifts for the Youth Pastor that was leaving. So easy to make. The kids did everything themselves. It takes a while to set. It smells and feels so good. I bought everything except the honey online (Amazon) thanks for the shopping link. And thanks for the idea. The kids LOVED making them. Hi Heidi. Loving your ideas and your beautiful way of explaining ways to do this. For the colorant, could I use yellow food coloring? I’m on a budget and new to soap making. I’m thinking about doing this with my girls’ program in the future. Thanks for your reply. Hi! These are adorable! Thank you for sharing. I’m excited to give these and the coffee ones a try. How long will they last – shelf life? I assume the scent and color slowly fades. I have school this Fall and was hoping to get a start on Christmas things. 🙂 Appologies if I missed someone asking the same question above. I made these for the goody bags we gave away for my granddaughter’s first birthday party. It was a Bee themed party. They turned out perfect! Super easy and everyone loved them. Doe the honey has to be organic? or it can be any honey? 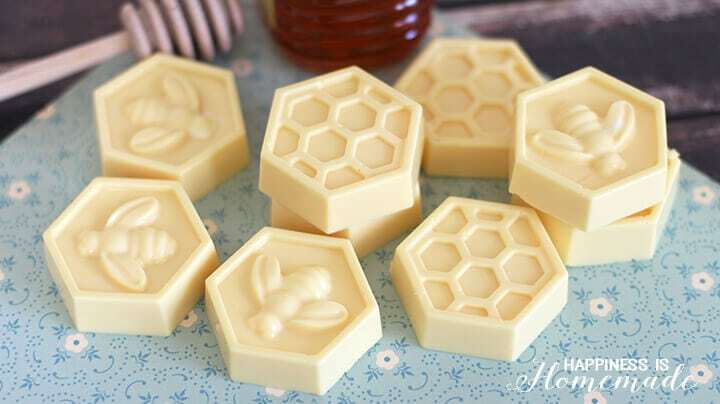 Hi Chen, you can use any honey, but using a honey that is minimally processed will provide you with the best benefits. How much honey did you use? 4oz 6oz ??? Found the amount, must have missed it the first time I read it! Thanks so much for recipe! I bet it smells divine. I am so glad I stopped by this site… this is so easy and good. Thanx for sharing. Had a query that how long the soap can be stores for. Please let me know. This was my first time making soap. I love yours, not mine. First the soap began to harden as I stirred the colors in, I did one drop red and five yellow and my color is dull. I will be trying this again……can you offer any advice?????? Thank you Heidi, I am going to make this again today…!!!! My family loves this soap. Can’t wait to see how it comes out!!!!! thank you Heidi..!!!! Have a blessed Thanksgiving. Would this recipe work if I replaced the goat milk soap base with Crystal African Black soap base? 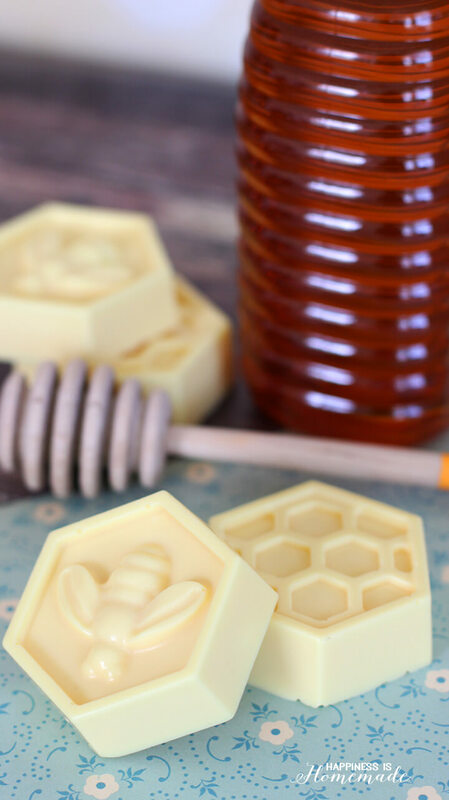 I really enjoyed these tips for making homemade soap. I was researching about doing and I came across your bolg. congratulations ! I am making these for the second time. I used them as holiday gifts last year and will again this year. They are great and everyone loves them. Thanks! Hi I made these last night, and I was going to give them as Christmas gifts what do you think the best way to wrap them is, and is it ok to add a few drops of some essential oils. Can you add oats to these without messing up the recipe and molding process? I am hosting a Tea Party next month with a ‘bee’ theme (bee-attitudes!). 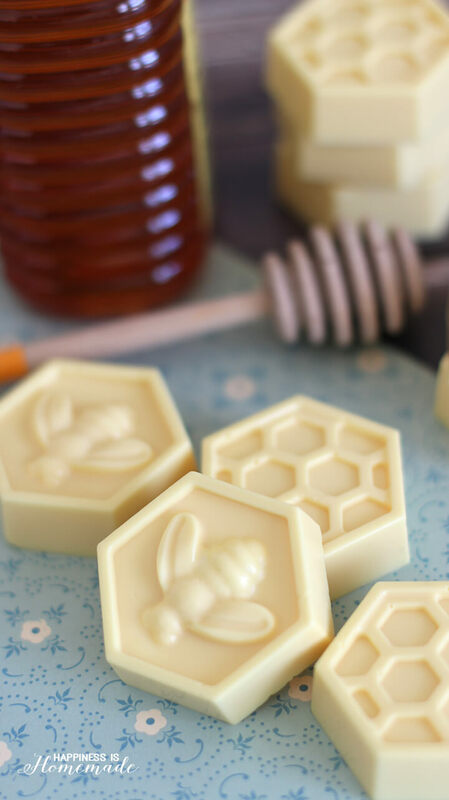 I had already found the bee/honeycomb mold on eBay as I wanted to make up little gifts for my ladies to take home and enjoy. 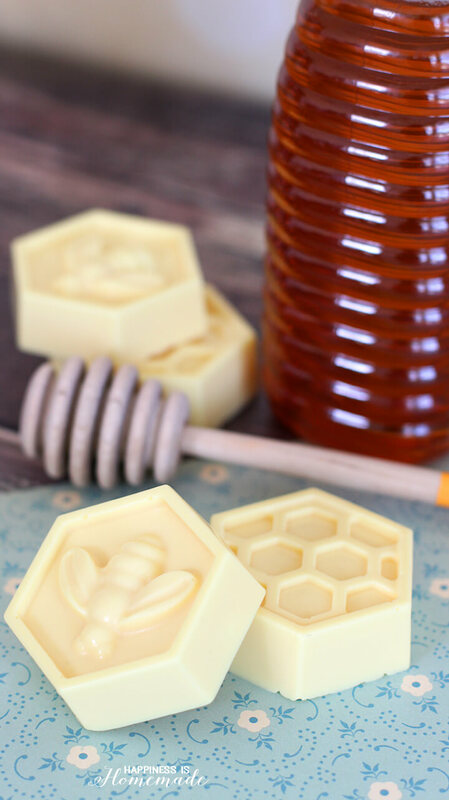 Found your soap recipe on pinterest and it was super quick and extremely easy! 1 lb of soap base made the entire 19 cavity mold. The soaps came out beautifully and I packaged them in small cellophane bags with black ribbons. Thank you so much for posting this recipe!